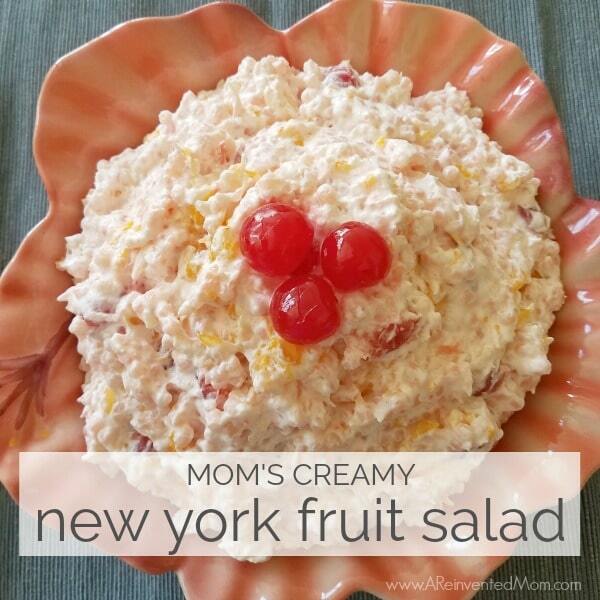 Equal parts sweet & savory, Mom’s Creamy New York Fruit Salad is a wonderful accompaniment to any meal. 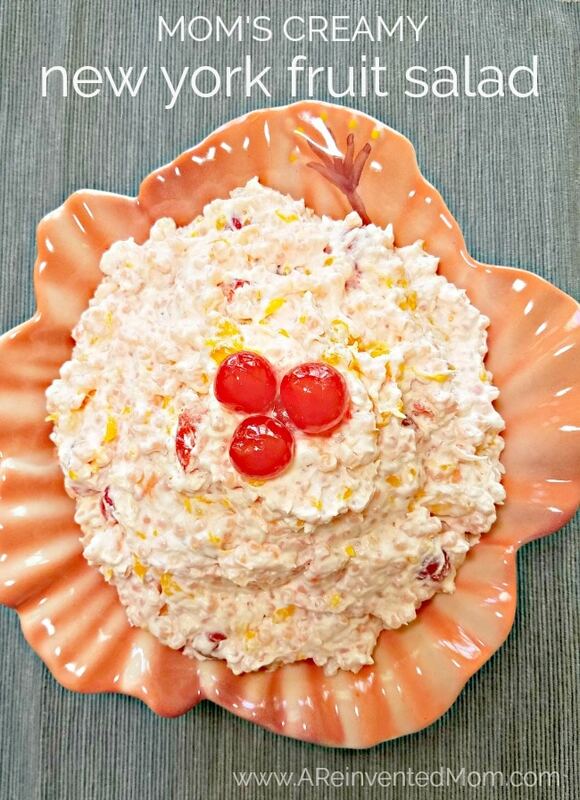 I’m excited to share a side dish from my Mom’s recipe box today – Creamy New York Fruit Salad. Growing up in the Midwest, family gatherings and holiday meals always included a fruit or jello salad. Mom’s Creamy New York Fruit Salad made frequent appearances as the not-too-sweet flavor profile made it a perfect complement to almost any meal. Ham – awesome! Turkey – so good! Burgers on the grill – amazing! Mom’s Creamy New York Fruit Salad was (and still is!) a family favorite. Studded with mandarin oranges, crushed pineapple and maraschino cherries, the savory acini de pepe pasta keeps this salad from being overly sweet. And you know what that means? You don’t have to feel guilty about having dessert later. That’s my line of thinking anyway. I typically complete the initial steps of Mom’s Creamy New York Fruit Salad the evening before. This allows the salad base mixture to set up overnight. All that’s left to do the next day is to combine the fruit and pasta mixture with the Cool Whip. Easy peasy! Acini de Pepe pasta – my favorite brand. Check the pasta section in your local grocery store or order online. 12″ Whisk – I use a whisk every single day. Measuring spoons – magnetized for easy, stackable storage. Mixing bowls with lids – a size for every job. I’ve shared this recipe at the following awesome parties: Meal Plan Monday, Weekend Potluck. Equal parts sweet & savory, Mom's Creamy New York Fruit Salad is a wonderful complement to any meal. Cook acini de pepe according to package directions. Rinse with cold water and drain. In a large bowl, combine drained fruits with the cooked acini de pepe. Using a medium saucepan, mix 2 cups reserved juice with 3/4 cup sugar. Stir to combine. Bring mixture to a full boil over medium heat. Temper the beaten egg by adding 2 Tbsp. of the hot juice mixture and stir. Add the tempered egg to the boiling juice and stir rapidly with a whisk. Mix 2 Tbsp. cold water with 2 Tbsp. cornstarch. Stir to combine. Add cornstarch mixture to the boiling juice and whisk together. Cook until thickened. Add thickened juice to cooked acini de pepe and fruit mixture. Stir to evenly distribute. Refrigerate for several hours until set. I usually prepare this dish the night before and refrigerate overnight. Add 8 oz. Cool Whip to macaroni and fruit mixture. Stir gently to combine. Nutrition facts are provided as a reference. Oh my goodness! We have been making this in my family since I was a kid. I call it Acini Di pepe salad, or Rosa Marina salad (with Rosa Marina pasta) or heavenly rice. Whatever you choose to call it, it is one of my favorites! Yummy! 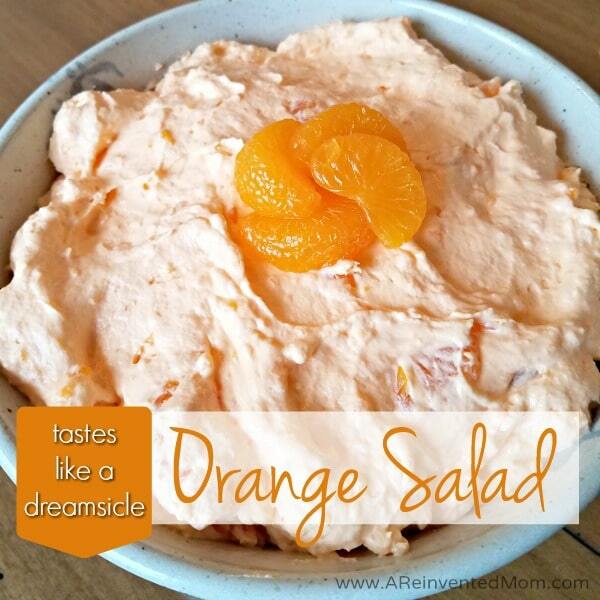 My mom always made this salad and even my grandchildren request it. I miss my mom but this always makes me feel her at every family get together when everyone goes for it first. We always just called it DePepe salad ! I think the best recipes are the ones that make us think of loved ones, Jill. 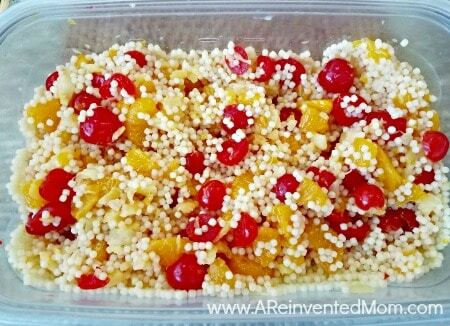 In our family, this is “Magic Salad” and we use it interchangeably as salad or dessert. My daughter polishes off all that’s leftover. Nice to have a recipe. Thanks! What a FUN name for this salad! Thanks for stopping by Virginia! Your fruit salad looks delicious. Thanks for sharing with us at Meal Plan Monday! Thank you for featuring my Mama’s New York fruit salad this week, Julia! I love this salad! I’ve had it with coconut but I don’t like coconut. Using orzo is a good idea for a substitute! I’ve never had it with coconut but it sounds delicious. It appears to be very similar although we’ve always called it New York Salad. Maybe it’s a regional thing? Cherry is an awesome flavor and it gives the salad a pretty pink tint. Thanks for stopping by, Brenda! Frog eyes are large pearl tapioca in pudding. Aunt Kay made it when I was a wee little, 60 years ago. Southern Ohio, so it all sounds regional, as well as generational, to me. This recipe sounds amazing, so I shall be making. Ahhhh, mystery solved! I hope you enjoy my Mama’s salad, Shelly. My family makes a similar salad but we use orzo pasta which looks like rice. How interesting, Wendy! I’ll have to remember to use orzo if I’m out of acini de pepe pasta. Thank you for this delicious sounding salad. I have a question about when to add the cool whip. Just to confirm step 7. you add the cool whip after it has been in the refrigerator over night or before serving? Hi Judy! Yes, you want to add the Cool Whip after the mixture has set up in the refrigerator. I hope you enjoy this dish! Never heard of this pasta where can I️ find it? Looks great! I purchase the acini de pepe in the pasta section at my local supermarket, Kathy. If you can’t find it locally, I’ve included a link above to order online. Looks so yummy. I just had to share on FB. Happy New Year! Thanks for sharing the recipe, Linda! Down south, we call this frog eye salad. Looking at the acini you can understand why. lol Wonderful recipe. This recipe is very similar to frog eye salad, Pam. We have always made this salad and have always known it as Frogs Eye Salad. Love it. It’s very similar to Frog’s Eye salad, Mia. My mom used to make this all the time for me as a kid.. we dont use sugar… its amazing without it, all the sweetness from the juices are good enough. 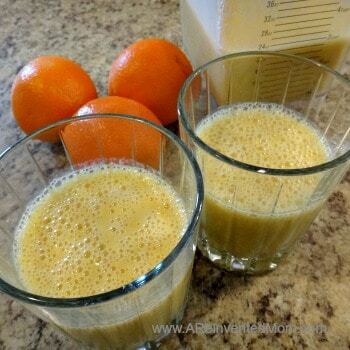 I just made myself a batch, a lil too.much juice made it a lil runny… opps! Still amazing! Thanks for sharing you make this without sugar, Caitlin. I’ll have to give it a try. Let me know how it turns out, Eve. s for Thanksgiving, even though she said I don’t have to make anything. I am 93 years old. New York salad is a great addition to a holiday menu. I hope you enjoy my Mom’s recipe as much as we do. Thanks for stopping by & have a wonderful Thanksgiving, June! I haven’t made this with fresh fruit, Annabelle. I would be concerned berries and softer fruits may keep the salad base from setting up. You could try mixing in the fruit immediately before serving. Please come back & update your results if you decide to try it with fresh fruits. I add canned peaches (diced) and slivered almonds. Soo good! I love peaches! What a great addition to the recipe, Carol. I had never heard of acini de Pepe until now! 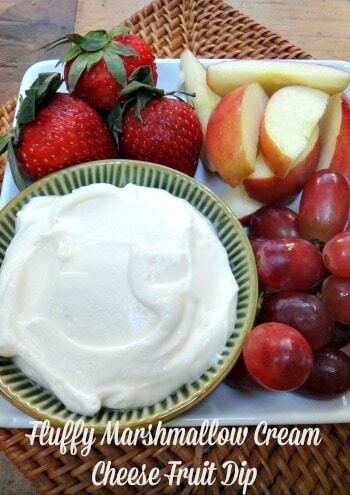 Your mom’s creamy fruit salad looks delicious! I never knew such a dish existed! Thanks for sharing it here at Fiesta Friday! I hope you enjoy this dish as much as we do! Thanks for stopping by.